Harold Bloom, the most muckity of literary muckity-mucks, frequently refers to the works of William Shakespeare as the secular scriptures. Bloom always tends toward hyperbole when talking about Shakespeare, but he’s certainly on to something here; for the intellectuals who find no solace in the Psalms, there are the Sonnets. For the cynics who do not share good news of Jesus, there are plenty of good times to be had with Fat Jack Falstaff. For the non-believers unmoved by the glory of Mecca, there is the ramshackle charm of the Globe Theater. 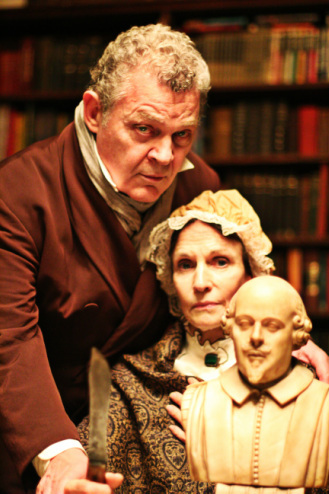 Nat Cassidy’s time-tossed play, Old Familiar Faces, explores the ways in which the Bard’s 400-year-old texts have continued to invigorate and enrich the lives of artists and people of letters across the centuries. It’s at once a bracing modern love story, a pseudo-historical account of disturbed siblings taking care of each other, and a written testament of Cassidy’s zeal as an ardent disciple of Shakespeare. These two stories are juxtaposed with a third style – Shakespeare’s. Cassidy peppers in Shakespeare’s words throughout, like Lee and Oliver sampling Beatrice and Benedick’s confession of love from Much Ado about Nothing when their own words fail; or in brief transitory scenes where the actors from both time periods share a couple of lines. In one jolting case, Nelson and Miller swap genders and enact a quick scene between Hotspur and Kate in Henry IV to punctuate Lee’s transition into the next phase of her career. The counterpoint here is spectacular, not to mention ballsy. It takes a lot of nerve for a playwright to put his own text right next to – literally – the greatest words ever written for the theater. Cassidy pulls it off, mostly thanks to the dry sense of humor sneaking through the piece and giving it mischievous life. Case in point, the way Nelson’s Oliver rolls his eyes when a philistine interviewer tells him her favorite Shakespeare play is Romeo and Juliet. Despite his own love for the material, Cassidy also clearly knows how puffed-up actors come across when they talk so serious about Shakespeare, and seems to enjoy giving them a little what for. An esteemed actor and voiceover artist, Tsoutsouvas glides through the text (both Shakespeare and Cassidy’s) like the wind in velvet, lusciously ruffling the language or giving it an occasional gusty snap. He is well matched by Ms. Cronyn, who is able to swerve from watertight snark to plunging despair in the space of a single line reading. The final confrontation between Lee and Oliver was perhaps a little overstated and idealistic for my tastes; it would have been enough to leave it with Lee’s invocation of the exquisite deep cut from Coriolanus: “There is a world elsewhere.” Nevertheless, both Miller and Neslon show incredible range and dexterity throughout and especially in an epic green room argument towards the end of their volatile affair. So now I feel like a total rogue and peasant slave for not being familiar enough with Cassidy’s work to appreciate this in the context of what he has done before – from what I’ve read this is quite a departure. I guess like any good Shakespearian follower, I will have to show up for Reverend Cassidy’s next sermon. Presented by Tin Drum Productions as part of the New York International Fringe Festival at The Players Theater.